Homeownership is often considered the key to achieving the American Dream, and is often regarded as a measure of adulthood. Yet many Credit Karma members are either not qualified or don’t think they’ll ever be able to afford a home. In fact, more than 65 million of our members don’t own a home. With nearly one in two millennials in the U.S. as trusted members, we saw a massive opportunity to bring simplicity and transparency to their home buying journey. 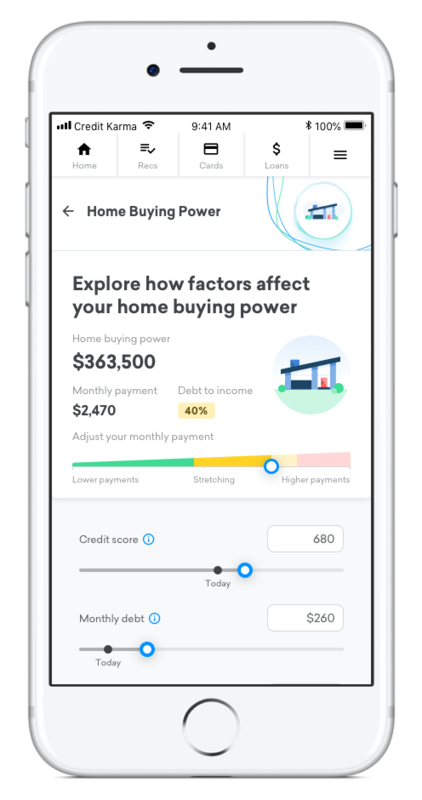 Today we’re proud to announce the release of Credit Karma’s Home Buying Power. Buying a house is fraught with questions: How much home can I afford? Where do I even start the process? Can I qualify for a mortgage? If not, what should I do to be qualified? While the mortgage industry is filled with countless calculators and automated tools, we didn’t want to just build ‘a tool’. 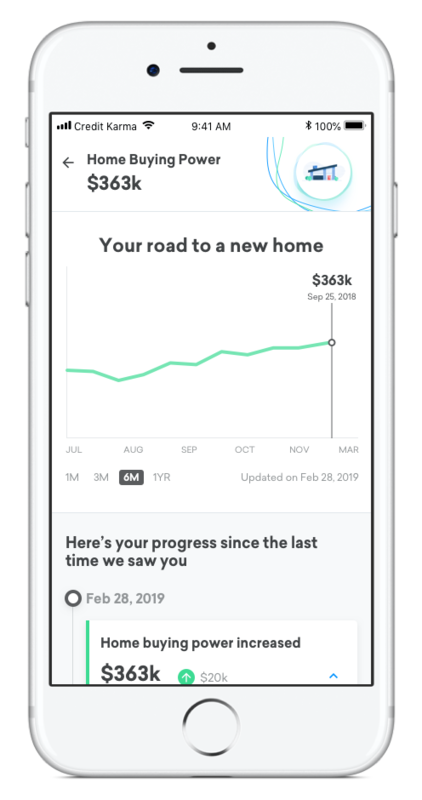 We wanted to create an experience that explained how much home you can afford like a trusted friend would, regardless of how far you are from buying a home – 3 months or 3 years. 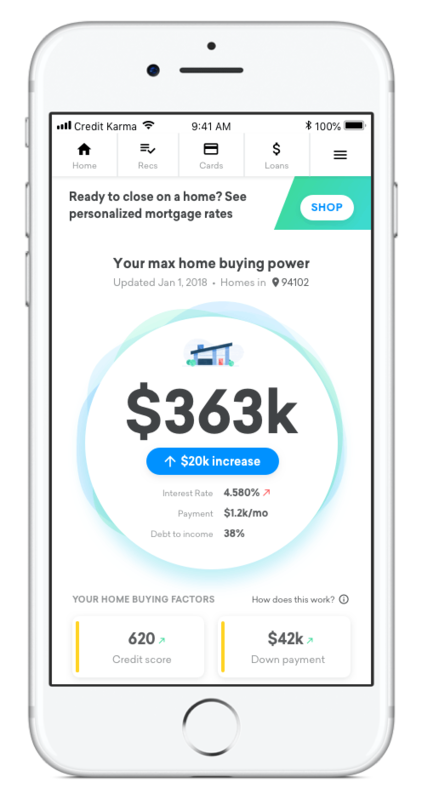 Home Buying Power shows how much home you can afford, teaches you about the factors that go into it, and helps you improve those factors and track your progress over time. Since we already have insight into credit and debt information from your credit report, we can seamlessly marry this information with your income and anticipated down payment to check for mortgage options in real time. That’s just cool, and it’s exclusive to Credit Karma. Similar to credit, we want our members to feel empowered so they can confidently approach what could be the biggest purchase of their lives. Since launching in September 2018, more than 1 million Credit Karma members have started that journey with us. What makes the journey challenging? Meet Donna. She is a Credit Karma member who was finally able to buy a house after looking for 25 years. She got declined for a mortgage multiple times before she finally got her finances in order to make it happen. Unfortunately, Donna is not alone. Nearly 50% of members who have used Home Buying Power so far are not qualified to buy a home yet primarily due to poor credit or large amounts of debt. With tighter credit requirements since the last financial crisis and student debt at its all time high, many of our members are stuck. They are striving to make progress, but historically there has not been one place to get advice and track how much closer they’re getting toward owning a home. This one boggles my mind the most. Myths around how the mortgage industry works are preventing highly qualified buyers from taking the first step. For example, many mistakenly believe they must put at least 20% down to buy a house. Not true! In fact, more than half of the loans taken out in 2017 had a down payment less than 20%, with some as low as 3.5% down. How are we making things better? Over the years, Credit Karma and Credit Karma Tax has offered multiple free services to our members like Identity Monitoring and DIY tax filing. Along the same lines, we believe everyone deserves to know how much home they can afford with no impact to their credit and no dollars spent. We’re on a mission to make that super easy. With Credit Karma’s new Home Buying Power, we help you understand the health of key factors – credit, debt, income & down payment savings. We don’t just tell you what’s up, but also provide interactive tools and curated content to help you learn by doing. Home Buying Power was built with simplicity in mind to help our members better understand what it takes to achieve the dream of homeownership. We do the heavy lifting automatically. Just check in on your home buying power to see how the things you do every day help you make progress toward your dream. Trust us, the little things add up. That way, whenever you’re ready to buy a house, you can be in the driver’s seat and power through with confidence. What excites us the most is that this is just the beginning. We don’t plan to stop with Home Buying Power. We are working to develop more personalized experiences to help you improve your credit and manage your debt to help you qualify for a mortgage faster. Beyond that, our goal is to provide you with helpful advice on when and where to buy. And, once you’re ready to buy, we’ll be there to ease the mortgage transaction process, making it seamless for you.